The Black Gold Quilt Patch (Leduc's Quilt Guild) started a Pizza Box exchange earlier this year. I have been working on my blocks but not so good at updating the blog. 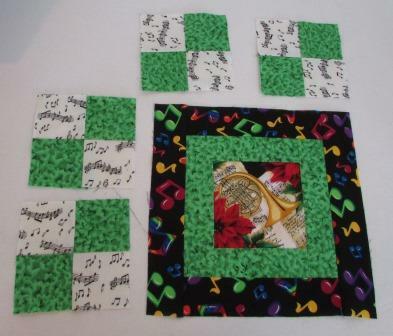 I am one of the more experienced quilters in the exchange so if I get to pick out a block, I am trying to make an effort to do harder blocks. 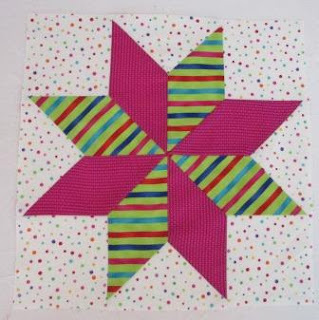 This bright little star block used Y intersections. I love the movement of the lime strip. This block was full of music fabric. I needed to add one more from my stash. I have loved this horn fabric, yes a little bit of Christmas but still a favorite. Then we were to do some 4 patches with some of the fabric we added. It has been fun to see what everyone asks us to make for them.